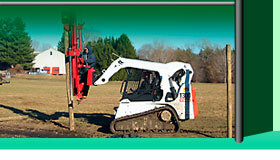 Stocking distributor of all deer fencing products. Driveway solutions: Precast concrete deer and cattle grates, manual or automatic gates. Specialty Agricultural Products is a family owned business dedicated to serving our customer’s needs for over 20 years now. Scott and Lauren Fallon are both University of Rhode Island graduates with degrees in the agricultural field and have experience in farming and greenhouse work before starting the company. We are proud of our work and pricing. We continue to find and research better ways to install deer fencing with new methods and new products (high tensile woven wire or vinyl coated hexagonal wire for example). We install and service a variety of fencing products in the northeast of America. We distribute and supply customers from coast to coast across the US. ©2013 Specialty Agricultural Products LLC. All rights reserved. Site designed and hosted by Design-2-Part Web Design.